This is a favourite bird of mine, because soft browns and tans, buffs and other such colours so often found in desert birds appeal to me. The Say’s Phoebe is by no means strictly a desert species (I saw my first one ever in San Francisco, near the ocean), but it does tend to inhabit the more arid regions of western North America and that is how I have shown it here. However, it is also found in western mountain forests, and in fact ranges from Alaska south deep into Mexico, and the odd one shows up here in Ontario from time to time, but is a rarity this far east. 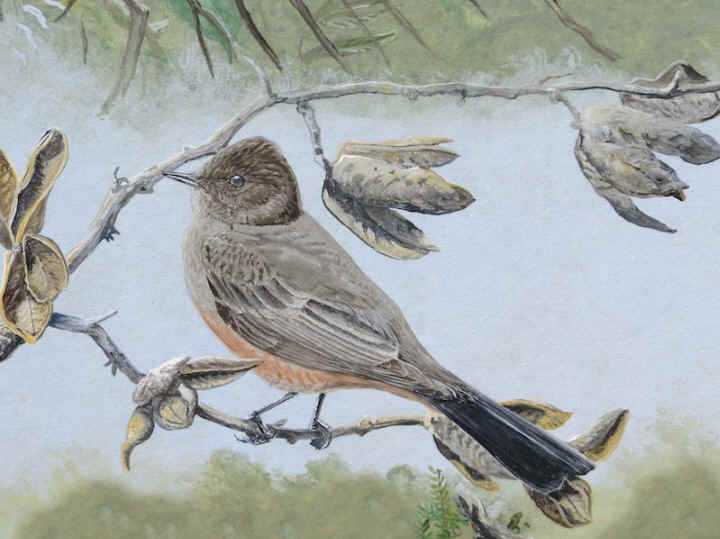 This painting is part of a mixed media (gouache and acrylic) composite paintings showing all the members of the genus, Phoebe. These birds tend to be common where they occur, easily heard and seen, and are members of the New World Tyrant Flycatcher family. They often can be found close to human habitations, and because they eat flying insects and are attractive in a gentle, understated way, they are well liked (if overlooked by the majority of people). 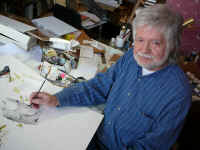 The painting is approximately life size, on illustration board.